NOTICE: Requires the base game Cities in Motion 2 in order to play. Activation key must be used on a valid Steam account, requires internet connection. 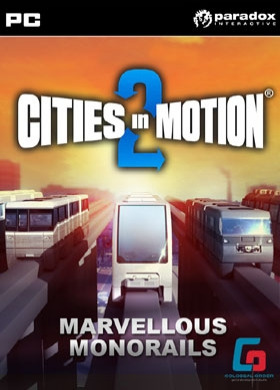 ABOUT THE GAMEMarvellous Monorails offers an all-new vehicle type to Cities in Motion 2. The monorail is a handy vehicle for innercity connections and works best in circular lines. The pack boasts five different monorail vehicles, from the slow but… very large Toyoka Cybria City, to the super-fast but quite high maintenance Stern-Berger Mate. An all new type of transportation! Monorails are a great choice for routes connecting different parts of the city. They are fast and attract a lot of passengers, and give your city a novelty look with their elevated rails. When a metro line is too expensive but you need a vehicle that is not affected by traffic, the monorail is your choice. Build circular lines for maximum efficiency and try all of the five different monorail vehicles to find just the right one for each line.KEY FEATURESToyoka Cybria CityThe Cybria City from Toyoka factories is very reliable, if somewhat slow and not the first choice of many passengers. For long routes with many stops, this trooper is a good option.Hana-Bi ChallengerHana-Bi Challenger is very eco-friendly with its low energy consumption. It is also fairly attractive to passengers and quite sturdy, thus requiring less maintenance than most vehicles.Ness MonoNess Mono is a sure favourite among passengers. It's very comfortable to ride and also fairly fast, so people get to their destinations quick and enjoyably.Capitol PalmThe Palm is manufactured by Capitol factories. It's a fast, reliable vehicle, but not very energy conservative. Due to its speed, it's excellent on longer routes with few stops.Stern-Berger MateWhen speed is what you want, Mate from Stern-Berger is your choice! Even though the Mate is small, it's very fast and attractive due to its modern design.SYSTEM REQUIREMENTS Windows Operating system: Microsoft Windows XP/Vista/7/8 Processor: 2 GHz Dual core Memory: 3 GB RAMHard Drive: 2 GB free hard disk space Video: nVIDIA GeForce 8800, 512 MB RAM or ATI Radeon HD 3850, 512 MB RAM DirectX®: 9 or aboveMac Operating system: OSX Snow Leopard 10.6.3 Processor: 2 GHz Dual core Memory: 3 GB RAM Hard Drive: 2 GB free hard disk space Video: nVIDIA GeForce 8800, 512 MB RAM or ATI Radeon HD 3850, 512 MB RAM Linux Operating system: Ubuntu 12.04 LTS Processor: Intel Core Duo Processor (2GHz or better) Memory: 3 GB RAM Hard Drive: 2 GB available space Video: nVIDIA GeForce 8800, 512 MB RAM or ATI Radeon HD 3850, 512 MB RAM Additional: GLSL 1.3, OpenGL 2.1. Paradox Interactive, CITIES IN MOTION® Copyright©  Paradox Interactive AB All rights reserved.